Dr. Nathan Formaini, D.O. is a board certified, fellowship-trained shoulder and elbow orthopedic surgeon with advanced training in shoulder replacement and arthroscopic shoulder and elbow surgery. He treats many shoulder and elbow disorders including arthritis, rotator cuff tears, tendonitis, sports-related injuries and fractures. Dr. Formaini also cares for many additional orthopedic issues and fractures throughout the body. Dr. Formaini joined Armstrong Orthopedic Associates in August of 2015. Born and raised in the Kittanning area, he graduated from Ford City High School and received his undergraduate degree from the University of Pittsburgh, graduating with honors. 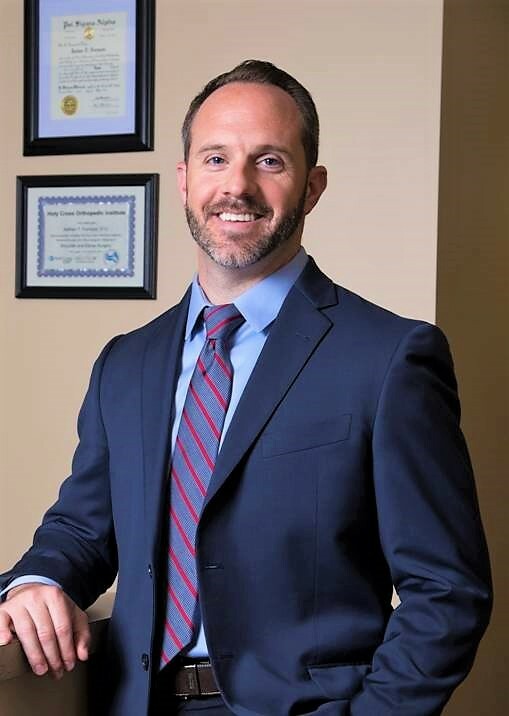 He attended the Lake Erie College of Osteopathic Medicine before completing a five-year orthopedic residency through Ohio University at Doctors Hospital and Grant Medical Center in Columbus, Ohio. He concluded his surgical training with a one-year shoulder and elbow fellowship under the direction of Dr. Jonathan Levy at Holy Cross Hospital in Fort Lauderdale, Florida. Dr. Formaini has a special interest in shoulder and elbow surgery, having completed a surgical fellowship focusing solely on complex shoulder and elbow problems. His diagnostic skills and surgical expertise in this particular area include reverse shoulder replacement, total shoulder replacement, total elbow replacement, arthroscopic shoulder and elbow procedures, and upper extremity fracture management. He also brings a superior level of care in the fields of general orthopedics, advanced fracture care, hip replacement surgery, and knee replacement surgery to Armstrong County and the surrounding region. Dr. Formaini has been very active in orthopedic research and authored multiple journal publications as well as textbook chapters on various orthopedic topics. He lectures at state, regional, and national meetings and also serves as a reviewer for research-based orthopedic journals. Married to his loving and beautiful wife Kristen, who also is from the Pittsburgh area. Enjoys kayaking, biking, fishing, hunting, and the great outdoors.